Placecast has built its business around delivering location-based offers to consumers based on geo-fencing technology. Now, it’s adding the ability for consumers to link their credit or debit card to an offer so they can redeem it at a nearby store with a swipe of their plastic. For businesses that utilize Placecast’s ShopAlerts offers, they now have a way to not just walk someone into a store, but they can measure how effective their marketing is when a user redeems an offer by card. Placecast said it is only charging for marketing when a consumer actually buys something in store. For consumers, it allows them to use a piece of plastic that most people are very comfortable using. They’ll be able to take advantage of discounts that offer a certain amount back in credit on their card statement for buying a product or spending a certain amount in store. Placecast has more than 160 customers who have used its ShopAlerts including AT&T (s t), Starbucks (s sbux), L’Oreal, The North Face, Subway, Pizza Hut, Kmart and HP (s hpq). In June, it rolled out ShopAlerts Wallet, which allowed companies to integrate ShopAlerts into their mobile wallet apps or into a newly built mobile wallet built from a Placecast template. While linking payment cards to offers is increasingly popular, Placecast said it’s able to apply real-time location data, consumer preferences and spend history to tailor the offers and make them relevant for users. It’s also utilizing a new patent that allows it to match a store’s location with the transaction data from processors, card issuers, retailers and mobile wallet providers. A store’s location can be marked differently in various databases, leading to failed redemptions because the location data isn’t consistent. Consumers still need to opt in for these offers and they will have to be relevant and interesting to get their attention. But this combination of location-based offers and simple redemption could be very powerful and attractive for marketers. If marketers can actually target people near their stores, lure them in with an offer easily redeemed through their card and only pay once a transaction is completed, it solves a lot of their problems. 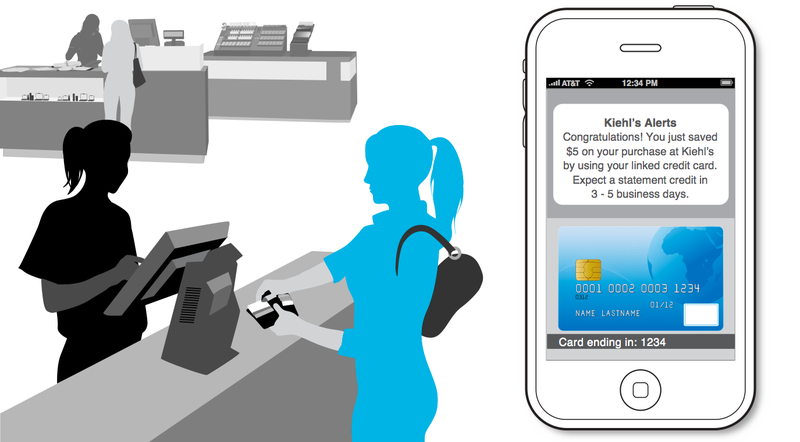 This is an interesting piece of technology, collaborating consumers with mobile and shopping. Customer opt-in is the only way this can work. The ability to opt-in to receive notifications of nearby deals is exactly what many consumers crave â€“ especially heading into the holiday buying season. Marketing has changed from pure promotion to the ability to deliver information when and how the customer wants it. Thanks for sharing, Ryan. We love commerce innovation that provides value to consumers and merchants which this innovation does. We also agree on only charging merchants based on performance. We are excited to launch Flash Purchase in several weeks where we enable consumers to band together to get the benefits of volume pricing and attain lower prices than any individual could get on their own while providing sellers with a large group of consumers in a single transaction.